Whether you are travelling with your caravan, camping or needing a well-appointed cabin we can assist with your accommodation options. 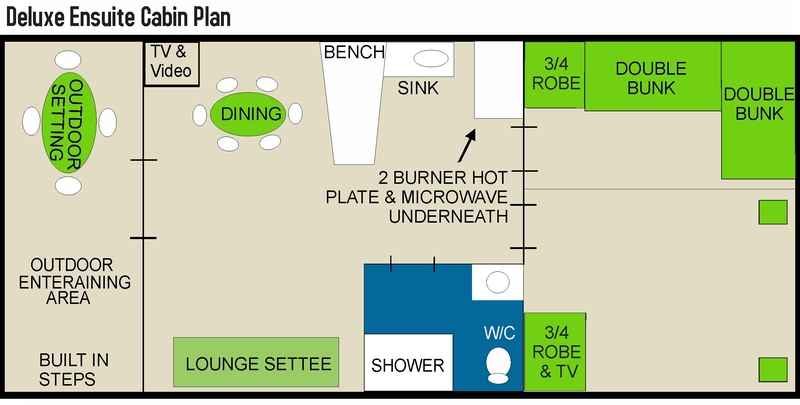 2 bedrooms (1 queen bed, 2 sets of bunks (4 beds), linen supplied for Queen bed only. Tariff for 2 people covers linen on Queen Bed only. If extra linen is required, the standard linen charge will apply. The Ozshacks gives you the chance to camp in style in a wooden tent! Commonly known as 'Glamping' which means Glamorous Camping. The hand crafted, Australian made shacks comfortably fit 2 people. The parks powered and unpowered sites are very spacious giving ample room for your car, caravan/tent and annexe. Most powered sites have a level lawned surface with plenty of mature trees throughout the park offering shade. Drive through and concrete sites available. Prices are based on one night for two people. Off Peak prices require a minimum stay of two nights to be redeemed in Cabins. Mid Peak periods are: January, April and October school holidays. Local special events are mid peak for sites only and Peak for cabins. Peak periods are: Easter, Christmas/New Year, all long weekends and Moorook Riverstock. Linen is supplied for Deluxe Ensuite Cabin and Ensuite Cabin on the Queen bed only. Tariff for 2 people covers linen for the Queen bed only. If extra linen is required, the standard linen charge will apply. 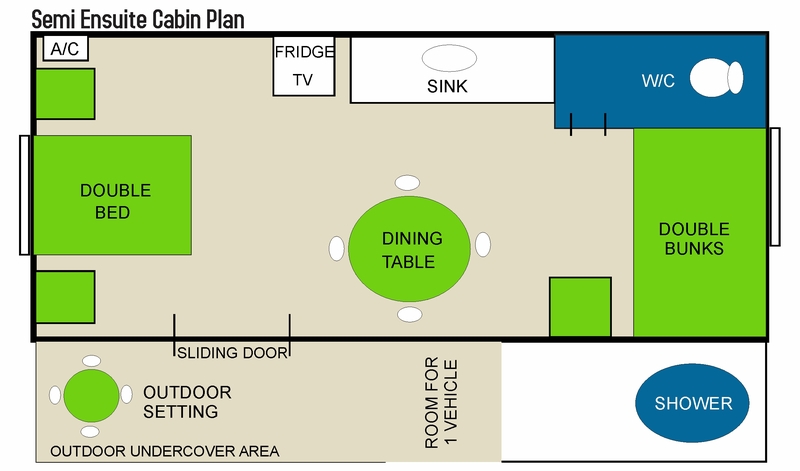 Linen for all other cabins can be hired for a one off cost of $20 per bed. Must be pre-booked and subject to availability. Minimum bookings in peak and mid peak periods. Weekly off peak rates available. Weekend one night bookings for on site accommodation - mid peak rates apply. No adults on top bunks.